Raised in a working environment, he left school early to join the Merchant Navy and the Royal Naval Reserve. After earning his master's ticket, he entered the service of the White Star Line, a prestigious British company. He quickly rose through the ranks and graduated in 1887. His first command was the SS Celtic. He served as commanding officer of numerous White Star Line vessels, including the Majestic (which he commanded for nine years) and attracted a strong and loyal following amongst passengers. In 1904, Smith became the commodore of the White Star Line, and was responsible for controlling its flagships. He successfully commanded the Baltic, Adriatic and the Olympic. In 1912, he was the captain of the maiden voyage of the RMS Titanic, which struck an iceberg and sank on 15 April 1912; over 1,500 perished in the sinking, including Smith, who went down with the ship. For his stoicism and fortitude in the face of adversity, Smith became an icon of British "stiff upper lip" spirit and discipline. Edward John Smith was born on 27 January 1850 on Well Street, Hanley, Staffordshire, England to Edward Smith, a potter, and Catherine Hancock, born Marsh, who married on 2 August 1841 in Shelton, Staffordshire. His parents later owned a shop. Smith attended the Etruria British School until the age of 13, when he left and operated a steam hammer at the Etruria Forge. In 1867, aged 17 he went to Liverpool in the footsteps of his half-brother Joseph Hancock, a captain on a sailing ship. He began his apprenticeship on Senator Weber, owned by A Gibson & Co. of Liverpool. Smith was Majestic's captain for nine years commencing in 1895. When the Boer War started in 1899, Majestic was called upon to transport troops to Cape Colony. Smith made two trips to South Africa, both without incident, and in 1903, for his service, King Edward VII awarded him the Transport Medal, showing the "South Africa" clasp. Smith was regarded as a "safe captain". As he rose in seniority, he gained a following amongst passengers with some only sailing the Atlantic on a ship he captained. Smith even became known as the "Millionaires' Captain". From 1904 on, Smith commanded the White Star Line's newest ships on their maiden voyages. 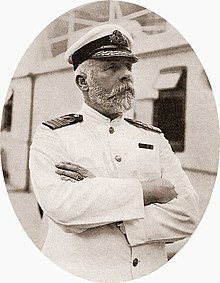 In 1904, he was given command of what was then the largest ship in the world, the Baltic. Her maiden voyage from Liverpool to New York, sailing 29 June 1904, went without incident. After three years with Baltic, Smith was given his second new "big ship," the Adriatic. Once again, the maiden voyage went without incident. During his command of Adriatic, Smith received the long service Decoration for Officers of the Royal Naval Reserve (RD). On 20 September 1911, Olympic's first major mishap occurred during a collision with a British warship, HMS Hawke, in which the warship lost her prow. Although the collision left two of Olympic's compartments filled and one of her propeller shafts twisted, she was able to limp back to Southampton. At the resultant inquiry, the Royal Navy blamed Olympic, finding that her massive size generated a suction that pulled Hawke into her side. Captain Smith had been on the bridge during the events. 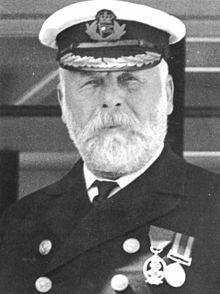 Despite the past trouble, Smith was again appointed to command the newest ship in the Olympic class when the RMS Titanic left Southampton for her maiden voyage. Although some sources state that he had decided to retire after completing Titanic's maiden voyage, an article in the Halifax Morning Chronicle on 9 April 1912 stated that Smith would remain in charge of Titanic "until the Company (White Star Line) completed a larger and finer steamer." The first four days of the voyage passed without incident, but on 14 April 1912, Titanic's radio operators[a] received six messages from other ships warning of drifting ice, which passengers on Titanic had begun to notice during the afternoon. Although the crew was thus aware of ice in the vicinity, they did not reduce the ship's speed, and continued to steam at 22 knots (41 km/h; 25 mph), only 2 knots (3.7 km/h; 2.3 mph) short of her maximum speed of 24 knots (44 km/h; 28 mph). [b] Titanic's high speed in waters where ice had been reported was later criticised as reckless, but it reflected standard maritime practice at the time. According to Fifth Officer Harold Lowe, the custom was "to go ahead and depend upon the lookouts in the crow's nest and the watch on the bridge to pick up the ice in time to avoid hitting it". The North Atlantic liners prioritised time-keeping above all other considerations, sticking rigidly to a schedule that would guarantee arrival at an advertised time. They were frequently driven at close to their full speed, treating hazard warnings as advisories rather than calls to action. It was widely believed that ice posed little risk; close calls were not uncommon, and even head-on collisions had not been disastrous. In 1907, SS Kronprinz Wilhelm, a German liner, had rammed an iceberg and suffered a crushed bow, but was still able to complete her voyage. That same year, Titanic's future captain, Edward Smith, declared in an interview that he could not "imagine any condition which would cause a ship to founder. Modern shipbuilding has gone beyond that." Other sources say that that he was very ineffective and inactive in preventing loss of life. Captain Smith was an experienced seaman who had served for 40 years at sea, including 27 years in command. This was the first crisis of his career, and he would have known that even if all the boats were fully occupied, more than a thousand people would remain on the ship as she went down, with little or no chance of survival. As Smith began to grasp the enormity of what was about to happen, he appears to have become paralysed by indecision. He had ordered passengers and crew to muster, but from that point onward, he failed to order his officers to put the passengers into the lifeboats; he did not adequately organise the crew; he failed to convey crucial information to his officers and crew; he sometimes gave ambiguous or impractical orders and he never gave the command to abandon ship. Even some of his bridge officers were unaware for some time after the collision that the ship was sinking; Fourth Officer Joseph Boxhall did not find out until 01:15, barely an hour before the ship went down, while Quartermaster George Rowe was so unaware of the emergency that after the evacuation had started, he phoned the bridge from his watch station to ask why he had just seen a lifeboat go past. Smith did not inform his officers that the ship did not have enough lifeboats to save everyone. He did not supervise the loading of the lifeboats and seemingly made no effort to find out if his orders were being followed. Just minutes before the ship started its final plunge, Smith was still busy releasing Titanic's crew from their duties; he went to the Marconi operators room and released Junior Marconi Officer Harold Bride and senior wireless operator John "Jack" Phillips from their duties. He then carried out a final tour of the deck, telling crew members: "Now it's every man for himself." At 2:10 a.m., Steward Edward Brown saw the captain approach with a megaphone in his hand. He heard him say "Well boys, do your best for the women and children, and look out for yourselves." He saw the Captain walk onto the bridge alone. This was the last reliable sighting of Smith. A few minutes later Trimmer Samuel Hemming found the bridge apparently empty. Five minutes later, the ship disappeared beneath the ocean. Smith perished that night along with around 1,500 others, and his body was never recovered. There are conflicting accounts of Smith's death. Some survivors said they saw Smith enter the ship's wheelhouse on the bridge, and die there when it was engulfed. The New York Herald in its 19 April 1912 edition quoted Robert Williams Daniel, who jumped from the stern immediately before the ship sank, in its 19 April 1912 edition as having claimed to have witnessed Captain Smith drown in the ship's wheelhouse. "I saw Captain Smith on the bridge. My eyes seemingly clung to him. The deck from which I had leapt was immersed. The water had risen slowly, and was now to the floor of the bridge. Then it was to Captain Smith's waist. I saw him no more. He died a hero." Captain Smith himself made statements hinting that he would go down with his ship if he was ever confronted with a disaster. A friend of Smith's, Dr. Williams, asked Captain Smith what would happen if the Adriatic struck a concealed reef of ice and was badly damaged. "Some of us would go to the bottom with the ship," was Smith's reply. A boyhood friend, William Jones said, "Ted Smith passed away just as he would have loved to do. To stand on the bridge of his vessel and go down with her was characteristic of all his actions when we were boys together." Because of these factors, as well as accounts of Smith going inside the wheelhouse, this has remained the iconic image of Smith, perpetuated by film portrayals. When working to free Collapsible B, Junior Marconi Officer Harold Bride said he saw Captain Smith dive from the bridge into the sea just as Collapsible B was levered off the roof of the officers' quarters, a story corroborated by first class passenger Mrs Eleanor Widener, who was in Lifeboat No.4 (the closest to the sinking ship) at the time. Also second class passenger William John Mellors, who survived aboard collapsible B, stated that Smith jumped from the bridge. Tim Maltin, author of 101 Things You Thought You Knew About The Titanic - But Didn't! affirms that the witnesses "could here be mistaking Captain Smith for Lightoller, who we know did exactly this at this time, first swimming towards the crow's nest." Several accounts say that Smith may have been seen in the water near the overturned Collapsible B during or after the sinking. Colonel Archibald Gracie reported that an unknown swimmer came near the capsized and overcrowded lifeboat, and that one of the men on board told him "Hold on to what you have, old boy. One more of you aboard would sink us all,"; in a powerful voice, the swimmer replied "All right boys. Good luck and God bless you.". Gracie did not see this man, nor was able to identify him, but some other survivors later claimed to have recognised this man as Smith. Another man (or possibly the same) never asked to come aboard the boat, but instead cheered its occupants saying "Good boys! Good lads!" with "the voice of authority". One of the Collapsible B survivors, fireman Walter Hurst, tried to reach him with an oar, but the rapidly rising swell carried the man away before he could reach him. Hurst said he was certain this man was Smith. Some of these accounts also describe Smith carrying a child to the boat. Harry Senior, one of Titanic's stokers, and second class passenger Charles Eugene Williams, who both survived aboard Collapsible B, stated that Smith swam with a child in his arms to Collapsible B, which Smith presented to a steward, after which he apparently swam back to the rapidly foundering ship. Williams' account differs slightly, claiming that, after Smith handed the child over to the steward, he asked what had become of First Officer Murdoch. Upon hearing news of Murdoch's demise, Smith "pushed himself away from the lifeboat, threw his lifebelt from him and slowly sank from our sight. He did not come to the surface again." These accounts are almost certainly apocryphal, according to historians featured in the A&E Documentary Titanic: Death of a Dream. Lightoller who survived on Collapsible B never reported seeing Smith in the water or receiving a child from him. There is also no way survivors on Collapsible B would have been able to verify an individual's identity under such dimly lit and chaotic circumstances. It is more likely based on wishful thinking that the person they saw was the Captain. Captain Smith's fate will probably remain uncertain. For many years, there were also conflicting accounts of Smith's last words. Newspaper reports said that as the final plunge began, Smith advised those on board to "Be British boys, be British!" Although this is engraved on his memorial and portrayed in the 1996 TV miniseries, it is a myth popularised by the British press at the time.[when?] If Smith had said these words to anyone, it would have been to the crew, but not one of the surviving crew members claimed he did. Because Steward Brown's account of Smith giving orders before walking onto the bridge was the last reliable sighting, this would make Smith's last words simply "Well boys, do your best for the women and children, and look out for yourselves." 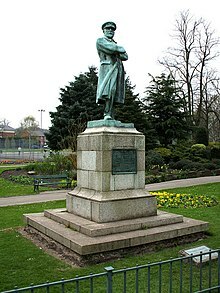 A statue, sculpted by Kathleen Scott, wife of Antarctic explorer Robert Falcon Scott, was unveiled in July 1914 at the western end of the Museum Gardens in Beacon Park, Lichfield. The pedestal is made from Cornish granite and the figure is bronze. Lichfield was chosen as the location for the monument because Smith was a Staffordshire man and Lichfield was the centre of the diocese. The statue originally cost £740 (£70,000 with inflation) raised through local and national contributions. In 2010, as part of the 'Parks for People' programme, the statue was restored and the green patina removed from its surface at a cost of £16,000. 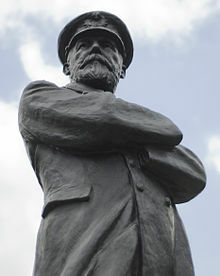 In 2011 an unsuccessful campaign was started to get the statue moved back to Captain Smith's home town of Hanley. This tablet is dedicated to the memory of Commander [sic] Edward John Smith RD, RNR. Born in Hanley, 27th Jany 1850, died at sea, 15th April 1912. Be British. Whilst in command of the White Star SS Titanic that great ship struck an iceberg in the Atlantic Ocean during the night and speedily sank with nearly all who were on board. Captain Smith having done all man could do for the safety of passengers and crew remained at his post on the sinking ship until the end. His last message to the crew was "Be British." The plaque was removed in 1961, given to a local school and then returned to the Town Hall but remounted in the interior of the building in 1978. The Titanic Brewery in Burslem, Stoke-on-Trent is in honour of him. Smith's mother, Catherine Hancock, lived in Runcorn, Cheshire, where Smith himself intended to retire. She died there in 1893. Smith's half-sister Thyrza died in 1921 and his widow, Sarah Eleanor Smith, was hit and killed by a taxi in London in 1931. Their daughter, Helen Melville, married and gave birth to twins, Simon and Priscilla. Simon, a pilot in the Royal Air Force, was killed in World War II. Priscilla died from polio three years later; neither of them had children. Helen died in 1973. ^ "Letter to daughter reveals softer side of Titanic captain". Stoke Sentinel. 2 October 2015. Archived from the original on 8 April 2017. Retrieved 2 November 2016. ^ a b "Plaque for Titanic captain's house in Stoke-on-Trent". BBC News. 20 March 2012. Retrieved 26 March 2012. ^ Emma Kasprzak (15 March 2012). "Titanic: Captain Edward John Smith's legacy". BBC News. Retrieved 15 April 2012. ^ Butler, Daniel Allen (2012). Unsinkable: The Full Story. Frontline Books. pp. 47–48. Retrieved 2 January 2012. ^ Cashman, Sean Dennis (1998). America Ascendant: From Theodore Roosevelt to FDR. NYU Press. p. 136. Retrieved 2 January 2015. ^ Bonner, Kit; Carolyn Bonner (2003). Great Ship Disasters. MBI Publishing Company. pp. 33–34. ISBN 978-0-7603-1336-7. ^ GIbbons, Elizabeth. "To the Bitter End". williammurdoch.net. Retrieved 4 November 2018. ^ ""Why A Huge Liner Runs Amuck"". Popular Mechanics. February 1932. Retrieved 4 November 2018. ^ For example, the account of his planned retirement is prominently mentioned at the Titanic attraction museums in the United States. ^ Butler, Daniel Allen (1998). Unsinkable: The Full Story of RMS Titanic. Mechanicsburg, PA: Stackpole Books. p. 130. ISBN 978-0-8117-1814-1. ^ "British Wreck Commissioner's Inquiry. Day 9". Titanic Inquiry. ^ Spignesi, Stephen (2012). The Titanic for Dummies. John Wiley & Sons. p. 207. Retrieved 6 November 2012. ^ "Smith information at". Titanic-titanic.com. Retrieved 2012-11-06. ^ a b c Kerr, Andy (3 November 2011). "Captain of the Titanic is here to stay despite no local connection". Lichfield Mercury. Lichfield. p. 29. ^ "Photo of Plaque: Commander Smith of The RMS Titanic". Panoramio. Retrieved 6 September 2012. ^ Barczewski, Stephanie (2006). Titanic: A Night Remembered. London: Continuum International Publishing Group. pp. 172–173. ISBN 978-1-85285-500-0. ^ Barczewski, Stephanie (2006). Titanic: A Night Remembered. London: Continuum International Publishing Group. p. 175. ISBN 978-1-85285-500-0. ^ Gary Cooper (31 October 2011). Titanic Captain: The Life of Edward John Smith. History Press Limited. pp. 300–. ISBN 978-0-7524-6777-1. In 1931, Eleanor was ... knocked down by a taxi cab in Cromwell Road, dying a short while ... A verdict of accidental death was returned by the coroner. Wikimedia Commons has media related to Edward Smith.